Purge & Trap Sampler is a Thermal Desorption system with Curie point heating method, which enables sensitive analysis of wide range of sample from low boiling compounds to high boiling VOC with sharp and reproducible chromatogram. 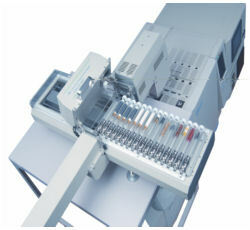 The largest capacity quartz sample tube (PAT) enables the analysis ofsmall electronic parts or polymer materials directly without sample preparation. Sample tube packed with adsorbent, i.e. TenaxTA or TenaxGR, are available too to analyze trace components in environmental atmosphere, in cleanroom air and from volatile contaminants from electronic parts. VOC and outgas analysis are completely supported with lineups of baking ovens to keep PAT always clean and extensive out gas collectors as peripheral equipment. Sensitive analysis of wide range samples from low to high boiling compounds. Large capacity of PAT contains large quantity of adsorbent, which enables to trap large volume VOC samples at a time. 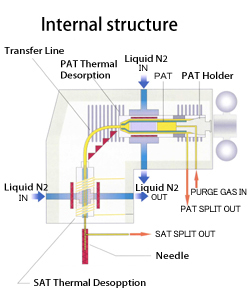 Large capacity of PAT which is the largest in the market (10ml internal volume, 12mm i.d., 50mm H) enables sensitive analysis of outgas from solids, i.e. small electronic parts, palletized solids etc. without pretreatment. Any commercial GC can be interfaced.